Since a recent update of the LinkedIn search for personal accounts (including the paid business accounts), we are now seeing the above screen for the searches that used to work fine. LinkedIn now limits the amount of AND or OR Boolean operators in a search. The limitation has little to do with “scraping” – and makes searching using any personal account quite challenging. What LinkedIn wants is for people to sign up for Sales Navigator, Recruiter Lite, or LinkedIn Recruiter. Only those, higher-paid accounts will allow searching with many Boolean operators (as it’s often necessary). ORs are restricted – and that is very unfortunate! There is no set number of ORs that make queries fail but using more than 3-4 would result in the above screen. 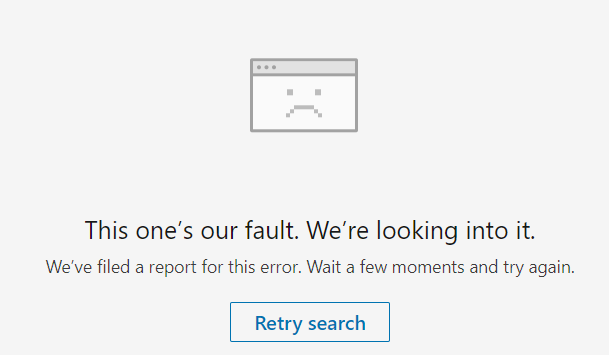 (Needless to say, the message on the screen “This one’s is our fault… Retry search” is quite misleading). Of course, we can still use X-Raying on Google, or a Custom Search Engine like http://bit.ly/LinkedIn-XRay, or Social List. Edited: I have found a workaround! Email me for details. I came across this today for the first time. I assumed it was a glitch given the screen message. Thanks for highlighting this Irina. Interesting! I work for an agency that provides LI Recruiter but in the past, I worked for one that didn’t. I wonder if this will change how those firms work or if they will just give in to paying LI $$$$? I assume you can do the same search by just removing the AND operator. Might be I am mistaken, but I gave it a go and it appears to work fine. If this means that you will not be needing the AND operator for your boolean string, I cannot say. The obvious workaround would be to Xray search or use CSE, as stated. Peter, yes, exactly, just remove the AND operator to make “AND” strings work. Now, I have found how to run search strings with multiple ORs. I hesitate to share it on my blog, but if you email me at irina@braingainrecruiting.com, I will reply and share.